First-term Putnam Legislator Anthony DiCarlo has withdrawn from the race for reelection to his District No. 9 seat. The Mahopac lawmaker, who is employed full time as a school administrator in Westchester, lost the Carmel GOP nomination in May to fo… Please login below or purchase a subscription to the Putnam County Courier to access this content. Was Obama Testy in Exchange with Maloney? Rep. Maloney, at left, at Boscobel earlier this year. On the right is Sen. Gillibrand. Maloney’s exchange last week with President Obama has drawn national attention. 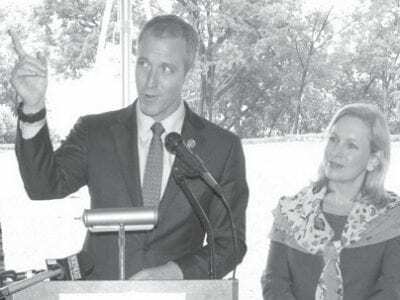 An exchange between President Obama and Rep. Sean Patrick Maloney regarding a poten… Please login below or purchase a subscription to the Putnam County Courier to access this content. Motorists traveling along I-84 from Putnam County into Connecticut faced traffic nightmares this week when construction projects in the greater Danbury area backed up eastbound traffic for more than 10 miles into Southeast. Road crews reduced three … Please login below or purchase a subscription to the Putnam County Courier to access this content. 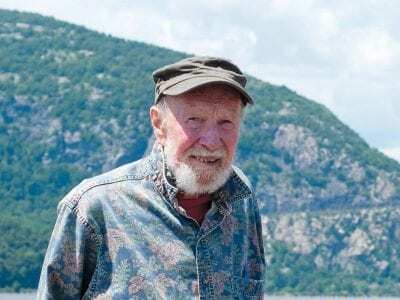 Pete Seeger at the Cold Spring waterfront, with Storm King in the background. Pete Seeger is about as iconic a personality as you can find on the streets around Beacon and Cold Spring. An award-winning musician, folklorist, political activist, and ad… Please login below or purchase a subscription to the Putnam County Courier to access this content. Hazel Martinez (left) was honored in May as Putnam Senior Citizen of the Year for her volunteerism. 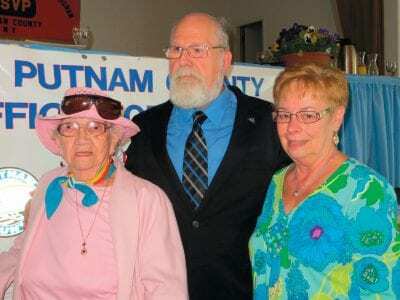 Director of Veterans Affairs Karl Rohde remembered Hazel Martinez Tuesday as an “all around great lady.” The 87-year-old resident of Putna… Please login below or purchase a subscription to the Putnam County Courier to access this content. Explorers learn the ropes of rescuing victims from vehicle crashes. Erin Scott looked around the Putnam Fire Training Center in Kent last weekend and beamed with pride. The Lake Carmel resident, who was a driving force behind the creation of the Expl… Please login below or purchase a subscription to the Putnam County Courier to access this content. Norma Pereira-Mora of Carmel discusses the traveling consulate with the Consul General of Guatemala Oscar Padilla during his visit to Brewster last Friday. An exciting initiative will be taking place in Brewster next month on Founders Day. In additio… Please login below or purchase a subscription to the Putnam County Courier to access this content. Motorists traveling along the Taconic State Parkway in Kent, Carmel and Putnam Valley thought they were witnessing a cops and robbers thriller when police began chasing a vehicle at speeds of 90 mph. The auto that was reported stolen in Danbury cras… Please login below or purchase a subscription to the Putnam County Courier to access this content.